This magnificent eagle was once common all around Britain’s coasts, and could be again if the right policies are put in place. Persecuted to extinction by 1918, it was reintroduced to Scotland, beginning in the 1970s, with birds from Norway. This has been a great success and they are now spreading further afield. 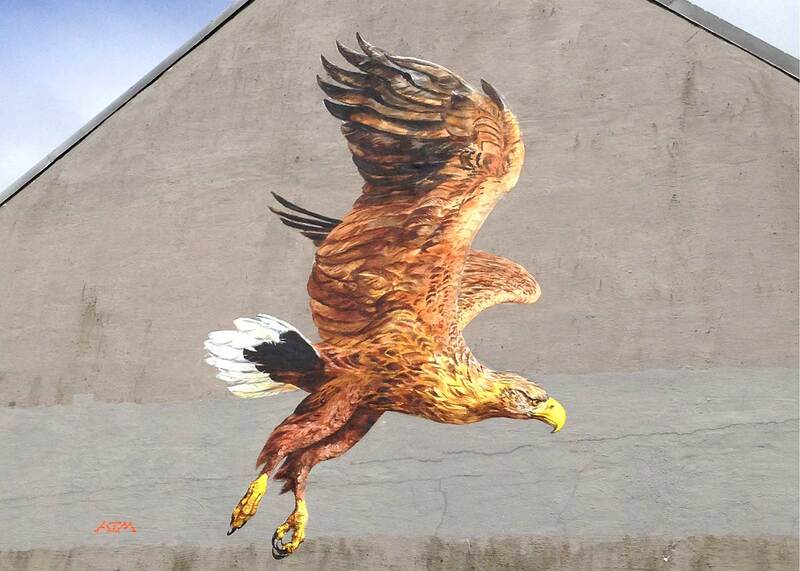 I painted this eagle in Stavanger as a way of saying thank you to the people of Norway and as a tribute to the conservationists from both countries who made this imaginative and difficult feat possible. It proves what can be achieved with cooperation, concerted effort and intergovernmental support. Though they take some lambs, the white tailed eagle, or sea eagle, has a hugely varied diet of seabirds, fish and wild mammals. Many of the lambs they eat are already dead or sick, but as is so often the case with raptors, eagles can easily be used as a scapegoat for all the unwanted deaths of the species we rear, when in fact so many die of other causes. With compensation for farmers and a more tolerant attitude towards eagles and their right to exist, these fabulous birds could once again be seen soaring in English skies.